AP Services, a product and service brand of Curtiss-Wright Nuclear, carries a large line of stock metal for any application. They are available in sheet form or can be cut to any finished form design using one of our abrasive waterjet cutting machines. Services abrasive waterjets can cut through metal materials ranging from 1/32 inch (0.794 mm) to 12 inches (305 mm) thick and are capable of +/- 0.001" linear positional accuracy and +/- 0.001" repeatability. 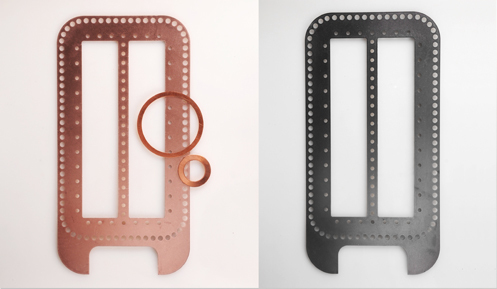 Metal gaskets are used in a wide variety of high pressure and temperature applications and on OEM equipment. Some of the most commonly used metals that AP Services carries are: copper, soft iron, 304 & 316 SS, Monel, Inconel, and aluminum. Services also supplies a complete line of Stainless Steel Pre-Cut Tab Shim Kits, ranging from .001” to .125” thick. Please call with your specific requirements, design ideas, or material inquiries and AP Services will be happy to work with you to meet all of your needs.